SilverlineTools: Rachel takes the win and Gee second! 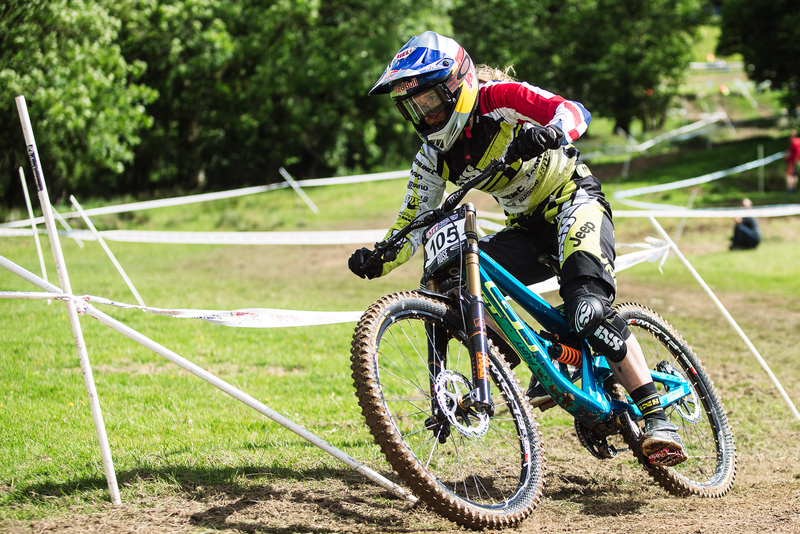 In one of the most enjoyable weekends racing of recent years, Rachel took the win by almost 14 seconds while Gee came in second, even overtaking a rider on the way! Taylor took a gamble on dry tyres which didn't come off for him - coming in sixth - and Dan made a mistake on his Finals run which cost him a chance of the podium but he definitely enjoyed his foray into downhill! First rider up for the team was Atherton Academy's Kade Edwards in the Youth category. Heavy rain during morning practice had made the track a very different proposition from yesterday's practice. Kade was fast through the speed trap but crashed out in the woods section, qualifying 13th in 5:27.631. Kade said:"Saturday was one of the most awesome day's riding ever but Sunday practice was pouring rain, awful mud clogging the bike up- it all started to go wrong. In qualis, I crashed four times: the first two were in the woods, Kaos (Seagrave) had to help untangle me. I got going again, got down to the field then fell in the second corner. I got back on, over the drop and in a left-sweeping corner I did the same again. It was horrible." In the junior women category sponsored by Rachel, Rona Strivens took the qualifying win despite a big crash, crossing the line in 7.38.06. All of the Elite Women crashed in the slippery conditions for their qualification race. 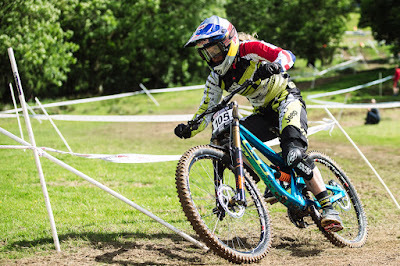 Rachel had a stall in the woods and crashed in the field but still managed to qualify first in 4:50.835, almost seven seconds ahead of Manon Carpenter and 22 seconds ahead of third-placed qualifier Tahnee Seagrave. By the Men's qualifying, the sun was out and light winds were helping the track to dry out. It didn't stop the crashes though. Taylor reported that while the open was drying nicely, the woods were still wet and lethal. Taylor washed out in the woods, qualifying 10th in 3.58.978, then both Gee and Dan went down. Dan had a small spill in the woods finishing in seventh (3.55.834) and Gee took a bigger tumble in the top section landing hard on his head. He qualified 36th in 4.34.433. Matt Simmonds took the qualifying win. By the time Finals came around the sun and the wind were well established and the track was drying well. In the Men's Youth, Kade had another difficult run with two crashes; he finished sixth in 4.22.230. His first odd was in the fast section of the woods, running into a stump his feet flew off and he landed heavily with his face smashing into his bars. He rode a pretty good woods section after that but got caught up in the first of two rutted corners in the open and got tangled up again. Kade said: "Not a good day for me, especially after yesterday was so rad - disappointing." In the Women's Finals, Rachel made her win look very easy - crossing the line 14 seconds faster than second-placed Manon Carpenter. Rachel said: "That was mint! I just seemed to get all my lines dialled. I totally agree with Kade, Saturday was awesome, loads of runs on an amazing track, no queues, sunshine, hanging out with the big brothers, then qualis was wet, slippery and just generally horrible, and then for Finals the sun came out and it was rad again!" 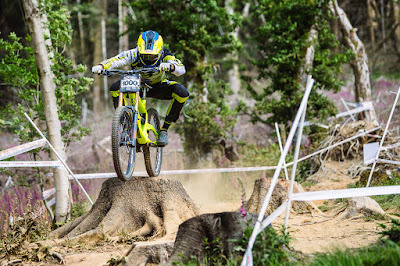 In the Men's Elite, Gee started well down the ranks after his quali crash. He overtook Scott Mears to cross the line 24 seconds up on the field in 3.26.09, enough for an eventual second place. 10th qualifier Taylor crossed the line in second place, 3.33.343, which was 6.5 seconds back from Gee but Dan clipped his foot on a tree in the greasy top section, crashing out and losing valuable time. He crossed the line in 11th, 3.41.06 enough for an eventual 17th. Taylor said: "I had a decent run but I made a few mistakes in the middle section and I'd taken a gamble with dry tyres that didn't pay off!" 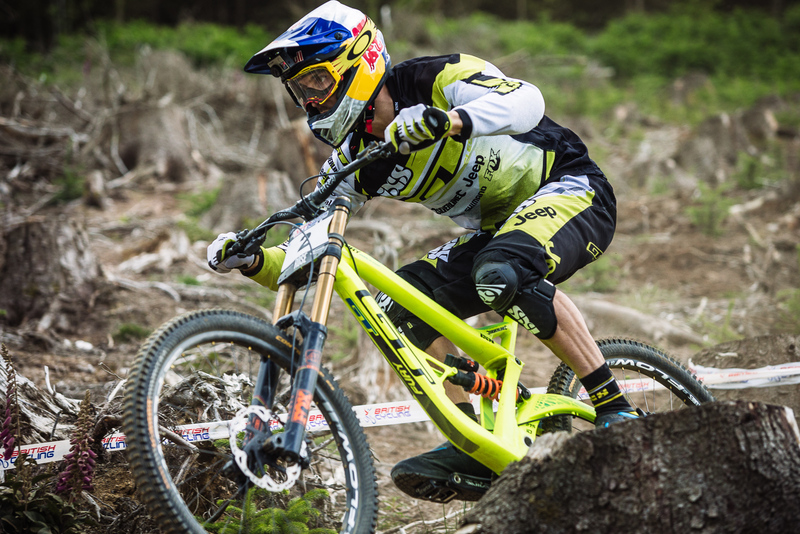 Dan said:"I think I really had forgotten how much fun racing Downhill can be. In Enduro, it's so easy to get sucked into your own world, riding with Martin for those long stretches, riding with Gee and Rach and getting to hang out between runs with the whole team is awesome. It's great to see the level of British Downhill Series is higher than ever with loads of great young riders coming through."